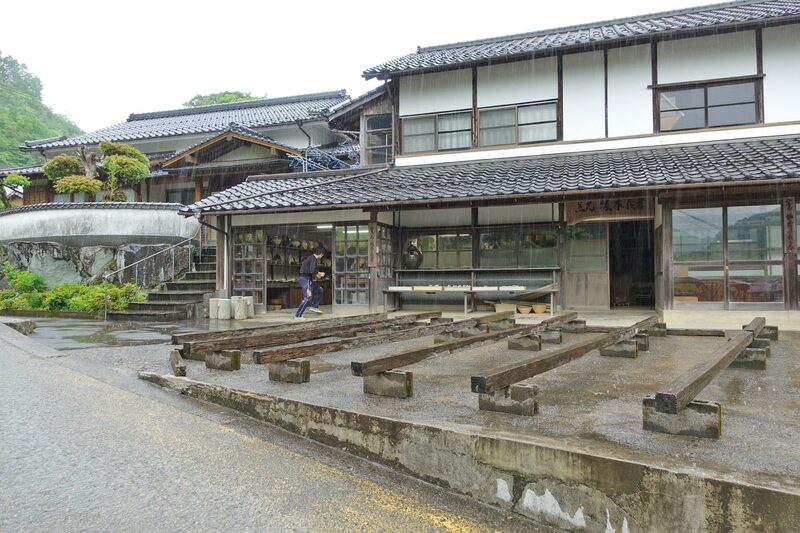 On a dreary, rainy May day, I visited the remote pottery village of Onta in Kyushu for the second time as an interpreter for a pottery tour group organized by Bill Geisinger and Ben Horiuchi. It has been 5 years since I last visited this magical place and I was keen to see its current state because the village had experienced a large earthquake in 2016, followed by heavy rains in the summer of 2017 that had flooded the town and surrounding areas. I had read news reports that the rain caused severe mudslides that cut off this already remote village from the rest of the world for a week. 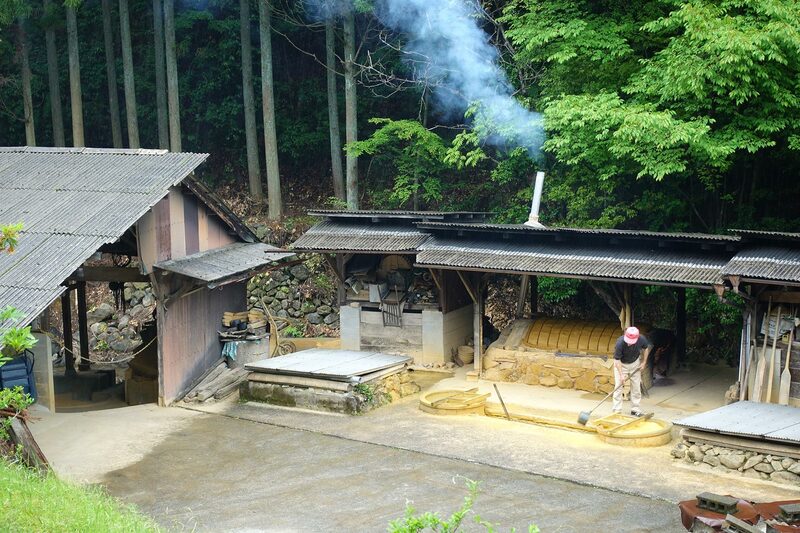 Sakamoto Yoshitaka preparing clay in Onta. 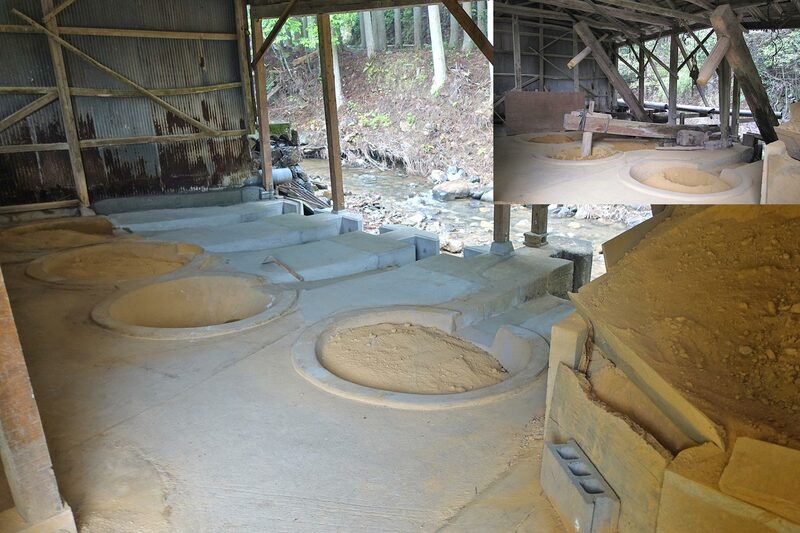 The clay is being dried on top of a drying kiln and to the left is a hut where the kara-usu -traditional clay-crushing devices- are to be reinstalled. The impact of these natural calamities on Onta’s pottery-making infrastructure has been devastating, but the spirit of its potters has been resilient. Many of the kara-usu, the traditional wooden clay-crushing devices that operate like a seesaw and are powered by water from the local river, were destroyed. This area was flooded in 2017 and all of the clay was lost. The kara-usu, seen in the top right insert of this 2013 photo, were also destroyed. 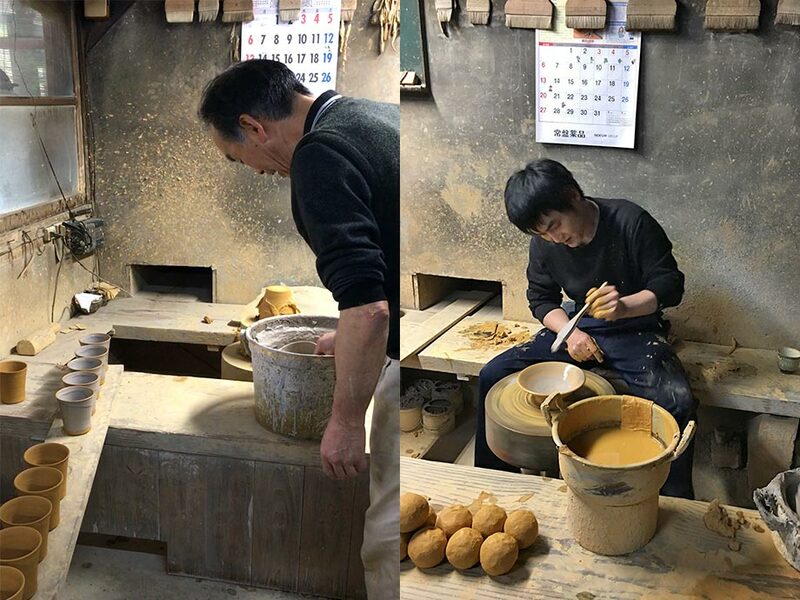 “Our kara-usu were destroyed and all the clay that we harvested were also washed away”, said Sakamoto Yoichi, a young Onta potter that we visited. He and his father Sakamoto Yoshitaka are the descendants of the original founders of Onta that began in 1705. “We have to go and get more clay”, Yoichi-san smiled and spoke cheerfully as he stood in the rain to show us the newly poured concrete in the clay-making area along the river. Onta clay drying atop a wood burning dryer. But “getting and making more clay” is no easy task. In Onta, the clay is prepared through the traditional method of harvesting, pounding, elutriating and drying of the material and this whole process takes well over a month of back-breaking work to complete. Onta’s way of life and especially its way of making pottery has changed little since Yanagi Muneyoshi (aka Soetsu), the father of the Mingei movement, visited in 1931 and recorded this approach in his famous book ‘Hita no Sarayama’. The front of the Sakamoto Yoshitaka kiln in Onta during a heavy downpour. On a sunny day, the pots will be drying out in the front. As we walked past Yoichi-san’s wood-firing kiln, we saw finished pots that were left inside of it. 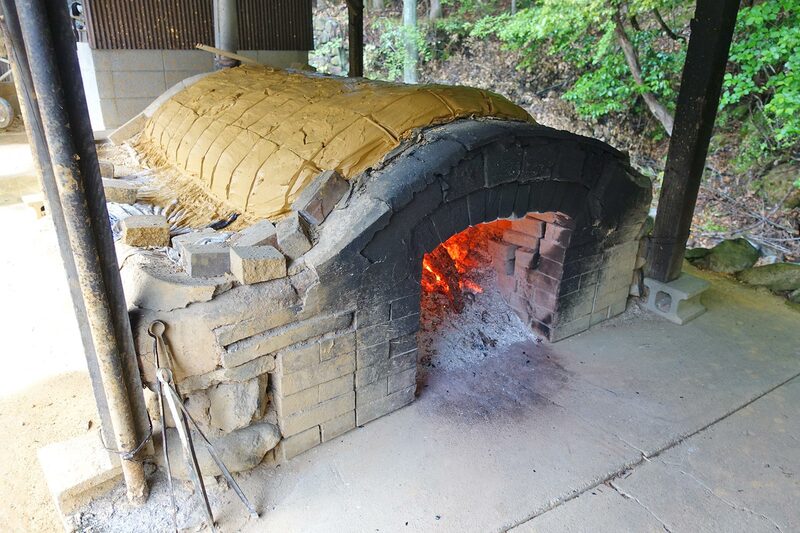 Yoichi-san explained that they were fired in the kiln in time for the Golden Week vacation (a week-long vacation in Japan from late April to the beginning of May), but the annual festival was cancelled this year because many Onta families still have not yet recovered from the 2017 disaster. “Even though the festival was cancelled, I was happy that many people came,” Yoichi-san said with a big smile. 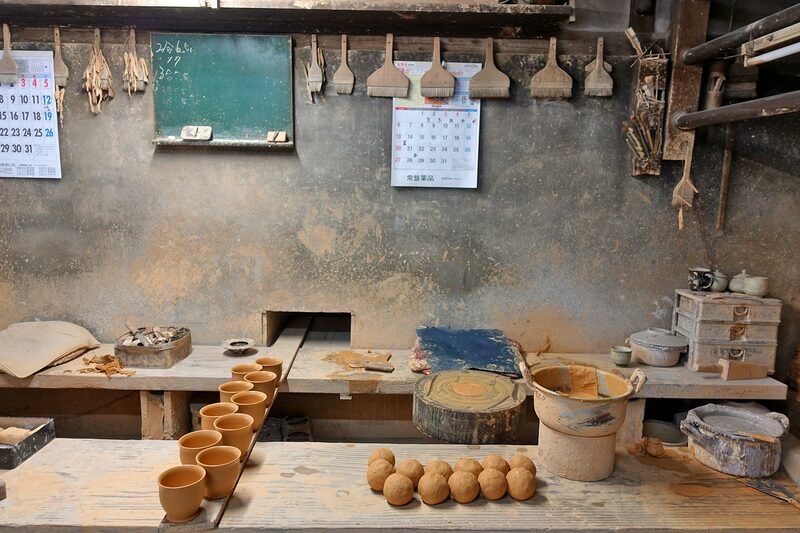 The workspace of Onta potter Sakamoto Yoichi. With a kick-wheel, no electricity is required, except for the lighting and radio that he listens to while working. In his studio, Yoichi-san and his father Yoshitaka-san demonstrated wheel-throwing and slip glazing for our group. 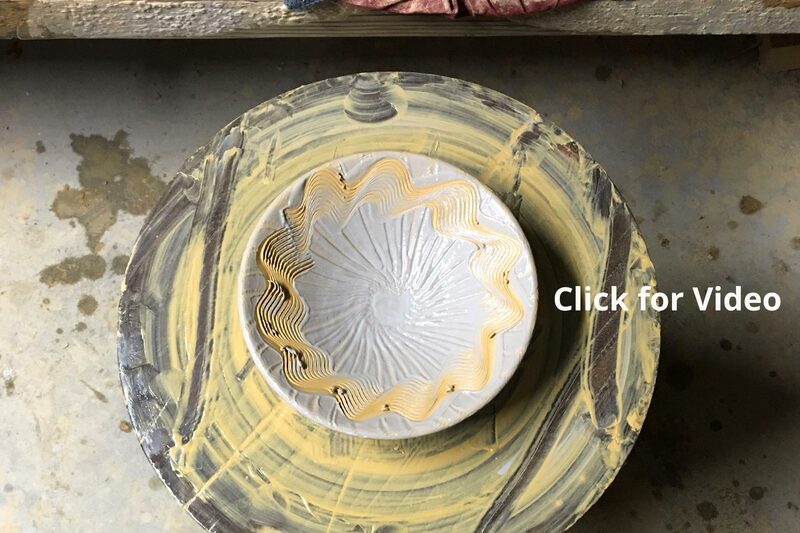 “I wanted to demonstrate the tobikan’na (chatter marking), but the pots are not dry enough unfortunately”, Yoichi-san said apologetically, “so I will demonstrate the hakeme (brush patted slip marking)”. Sakamoto Yoshitaka (left) and Yoichi (right) demonstrating slip-glazing and hakeme for the visiting group. I was very happy to be able to see this demonstration because even though the chatter-marking is probably the most famous slip decoration of Onta, my personal favorite is hakeme, which is also known as uchi-hakeme. I like hakeme because it involves a simple tool of a brush, and the tapping marks speak of the maker’s rhythm. Some other traditional Ontayaki decorations include yubikaki (finger marking) and kushikaki (comb marking). Hakeme and kushikaki on fresh Onta clay. Onta potters use very wet clay for throwing. Cream colored ontayaki with traditional decorations. Throughout the time our group was with the Sakamotos, I was touched by their kind and gentle manner. 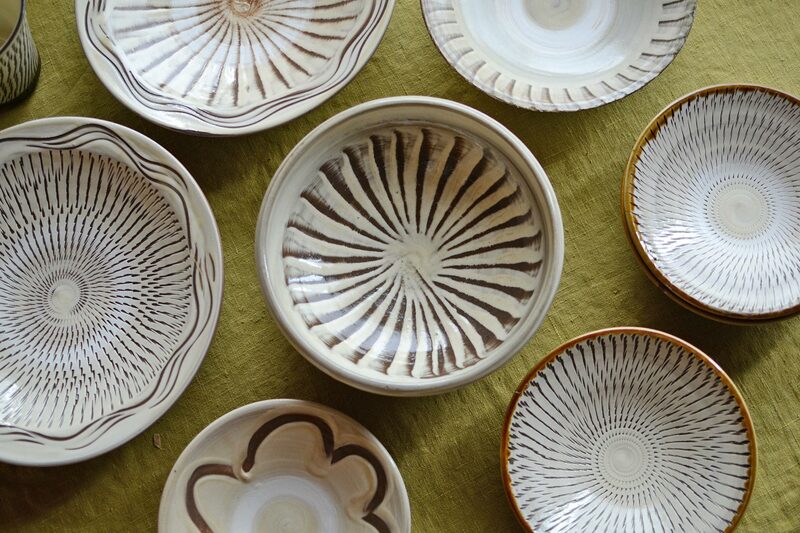 Just like the warm cream-colored Ontayaki (ontaware) pottery that they produce, their humbleness and optimism impressed me considering the huge challenges that they have had to deal with in the past several years. The original Hita no Sarayama by Yanagi Muneyoshi with a stencil dyed cover. 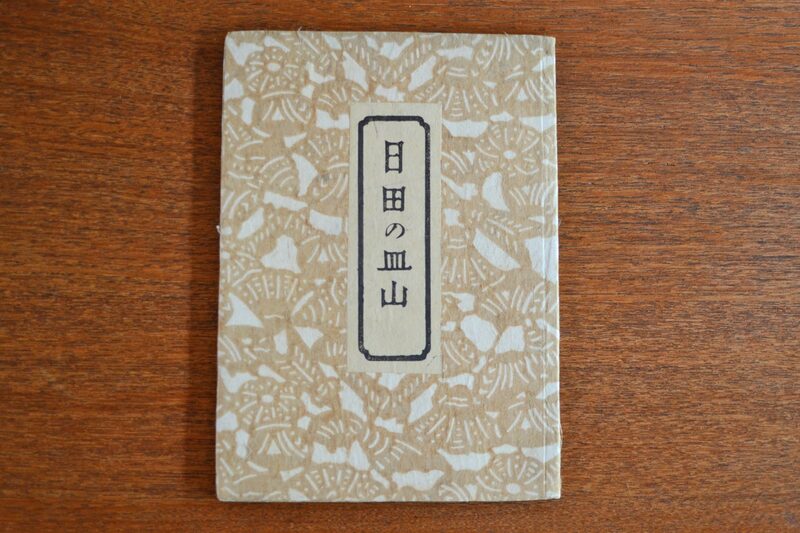 Onta was made famous by this small book published in 1942 and was designated as intangible cultural property by the Japanese government in 1995. 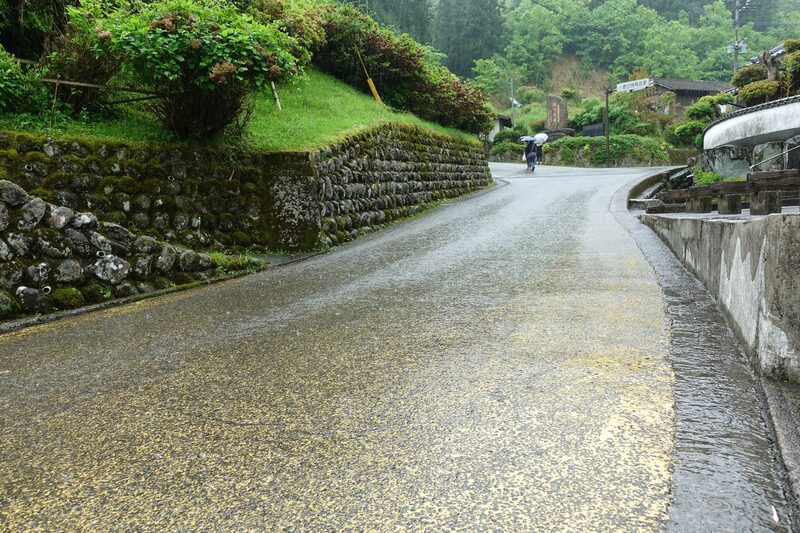 The one and only main road through Onta is covered in yellow from the clay that is constantly used and transported around the village. I now feel that I have a better understanding of what Yanagi meant. And if you ever have the opportunity to visit Kyushu, I urge you to make a special effort to visit this exceptional village and its resilient people.